This semester’s elementary Social Studies methods group jumped right into teaching! 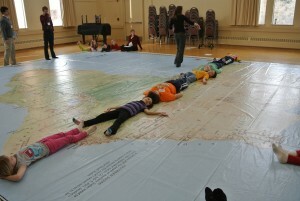 For our first day of class, we helped second grade students from St. Peter’s South Elementary explore National Geographic’s Giant Map of Africa. In this activity, we asked students to estimate whether Africa is longer north-south or east-west. Then the second grade students used their bodies to find in the answer!